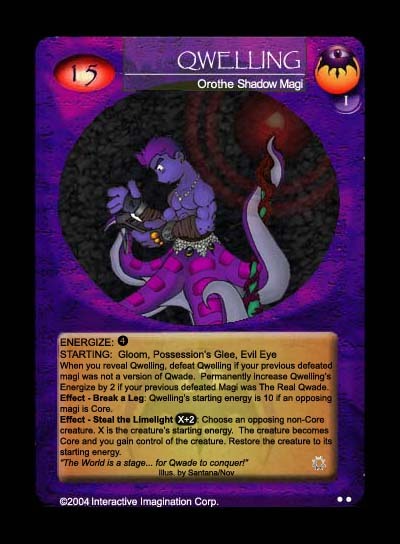 Qwelling was created for a Create a Card contest on Insiider and is one of the three cards in this set that is based on Mike Welling (the other two cards being Evil Eye and Charybdis Wellisk). The gist of the original text is still captured by the final card, although playtesting has modified it to make it a little bit more useful in a The Real Qwade deck. The original card features a photo of Welling at the 2002 GenCon, but that has been swapped out for this image by Eric Santana and myself..